Samsung Galaxy A9 hands-on hands on review | What Hi-Fi? It’s understandable that many people are feeling jaded and underwhelmed by 2018 flagship phones. Incremental upgrades have been the name of the game with recent launches, from the iPhone XS Max to the Pixel 3, despite astronomical prices. All this means it’s perhaps easy to lose sight of quite how much technology is packed into these five-inch slabs of glass. Perhaps one way to be reminded is taking a look at what’s on offer from midrange phones, like this, the new Samsung Galaxy A9 for 2018. We say 'new' Galaxy A9 because, unlike with flagship phones, Samsung has no qualms with recycling model names here. The Galaxy A9 is described as a 'premium midrange' phone and has some impressive specs and eye-catching features to match. The A9 is said to be 'optimised for the Instagram generation', with four (count ‘em) camera lenses on the rear of the device, and battery life coming a close second in terms of priorities. And for many people, that could prove a winning combination. Samsung is being elusive with the Galaxy A9's exact release date, revealing only that it will be available in the UK some time in November. The official price of £549 isn't 'cheap', but comes in at half the price of certain flagship phones we'd care to mention. One of our favourite things about the Galaxy A9 is the names of the finishes. Caviar black, lemonade blue and bubblegum pink are your choices, with the black model taking our fancy (we’re used to black boxes). The phone has gorilla glass on the front and back, and while it somehow doesn’t look or feel quite as premium as the flagship models – perhaps deliberately so – the handset does feel slim, light and predictably well put together. It’s marginally thicker than some of the top mobiles around but you really don’t notice it in your hand, the '3D Glass curved back' helping the handset to snuggle into your palm (provided your hands are big enough). There’s a fingerprint sensor on the back in a similar place to most other flagship phones on the market, but unlike on Samsung’s lower spec Galaxy J6 Plus and J4 Plus models, which have the sensor on the side. Also on the back you’ll spot the four camera lenses and a flash. The on/off/wake button and volume rocker are on the right, with a camera button on the left side. On the bottom you’ll see a USB-C connection and a 3.5mm headphone jack, which suits us just fine. All told, it’s hard to argue with the package. The Galaxy A9 screen is a large, 6.3in Full HD Super AMOLED. This is the same display technology as seen on the Galaxy S9 and Galaxy Note 9, though those flagship phones deliver a higher Quad HD+ resolution. The A9 settles for 2220 x 1080. Conversely, the Galaxy A9 battery is a hefty 3800 mAh, which is bigger than those aforementioned flagship phones. The world’s first rear quad camera will grab the headlines of course, but it brings Wide Angle, Telephoto and Live Focus into play. The main lens is a 24MP camera, and will be your go-to when you opt for simple point and click. But if you do want to get clever, you have the choice here. The Ultra Wide lens (8MP) gives you a larger field of view. The Telephoto lens (10MP) gives you 2x optical zoom, allowing you to home in on your target without affecting the image quality (which will take a hit if you just zoom in with a standard lens). Finally, there’s the Depth lens (5MP), which, together with Samsung’s Live Focus, allows you to adjust the bokeh of your photos. This is the quality of the background blur when your picture has something in focus in the foreground. Engage the mode and you’re given a slider to simply adjust the sharpness and feel of that blur. It’s a neat effect and one that’s become something of a buzzword, thanks to being highlighted on other phones, such as the iPhone XS. And if four wasn’t enough, there’s a front-facing 24MP lens, too. Inside the Galaxy A9 offers 128GB storage, with room for up to 512GB of extra space with the addition of a microSD card, and 6GB RAM. The usual suite of Samsung features are also here of course, such as the company’s oft-forgotten voice assistant, Bixby, plus Samsung Pay and Samsung Health. It runs Android 8.0 Oreo at launch and from our hands-on time, the skinning of the interface is about as close as it’s become apparent Samsung will get to having a light touch. AV support looks to be pretty standard, with WAV and FLAC files supported natively, though no sign of DSD (which is supported on the S9+). In fact there’s no mention of hi-res audio, though recent Samsung phones, certainly at the top-end, have supported it. We’ll look to clarify this in a full review. This phone certainly looks pretty good on paper and first impressions in use are equally positive. There isn't the immediate wow factor here that you'd get from a flagship handset, the finish is solid and familiar rather than exciting, and the screen doesn't jump out of the chassis with sharpness and detail, but it's more than satisfactory. It feels smart, the interface is fluid is responsive with not too much by way of unnecessary extras, and the screen is clear and colourful. Samsung's penchant for bright, punchy colours is apparent here and while with time we'd be sure to have a good go at the settings, the factory setting is clearly of the slightly over-saturated variety. Whether watching YouTube or indeed taking pictures, greens are lush rather than natural and skin tones can be a little ruddy. Compared to a class-leading camera such as the Google Pixel 2 XL, details in pictures can appear a little smoothed over and whites have a blueish tint. But with so much tinkering potential here, we loathe to judge too hastily from this brief hands-on time. We listened to a few tracks on Tidal and the sound was okay but nothing special. The tonal balance is a little soft, lacking a little detail and excitement but we'd imagine it will hold its own at a step below the best music phones upon longer listening. The speakers on the phone itself won't match some of the more powerful options around, either, so we'd stick to headphones. Luckily, the headphone jack is here alongside the newer USB-C connection. As for that chunky battery? We'll have to wait and see, as that really is impossible to judge at a preview session. With so much focus on the flagship smartphones, it's easy to forget there are alternatives on offer – and how much you can get for your money. 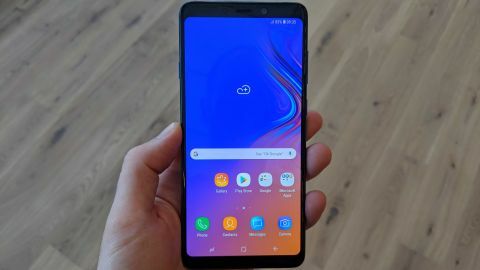 The Samsung Galaxy A9 is half the price (or close) of many of the top phones on the market, but still packs in a big battery, that feature-packed camera, a fingerprint sensor and those jazzy colour finishes.